They say that the eyes are the window to your soul. And so they deserve to be decked up to reflect that importance. Even if you need to run out the door in a hurry, just a little bit of liner on the eyes is enough to get you looking fabulous in moments. Whether you like to keep it minimal by tight lining your eyes or going for a dramatic style with big and bold winged eyes, the question still remains – what kind of eyeliner you should choose? Everybody has their own personal choice, but for someone who is new to the makeup game, it can get quite confusing when you go to the beauty counters at the store. How do you know if you need a gel liner or will a basic pencil one suffice? We have tried to break it down here to make it simpler for you to choose the next time. 1. 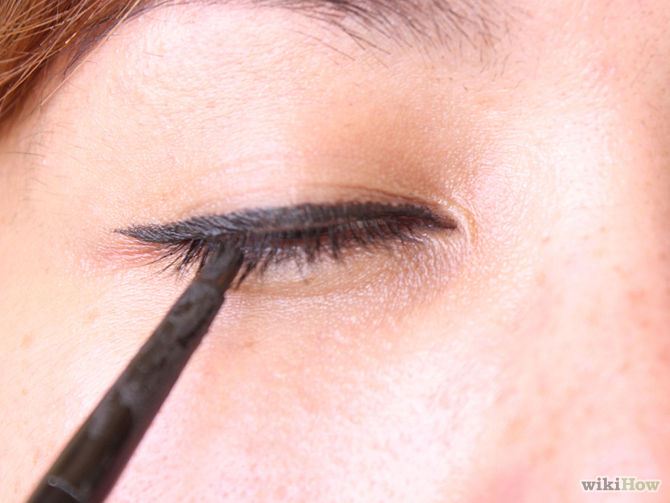 Pencil eyeliner: A pencil eyeliner is the best tool for beginners. 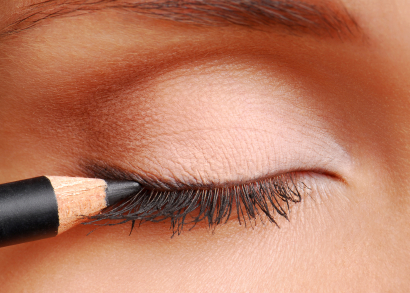 The primary benefit of a pencil is that it can be used as an eyeliner, kajal as well as an eyeshadow base all at once. The pencil has a soft finish which makes for easy application and correction. But it is not the ideal choice if you are looking for a clean and precise line. If you are a fan of smokey eyes and want to get the look without spending too much time in front of the mirror every day, go for a pencil eyeliner. It can be smudged easily to create a subtle smokey effect with ease. One of the greatest things about pencil eyeliners is the sheer variety available in terms of colors. Pencil eyeliners are a great choice for college going girls who like to experiment with different looks to suit their outfits every day. 2. Liquid eyeliner: If you want absolutely defined lines or a thin winged liner look, then go for a liquid liner. These usually come in the form of a felt tip applicator pen or in a bottle with an applicator stick. 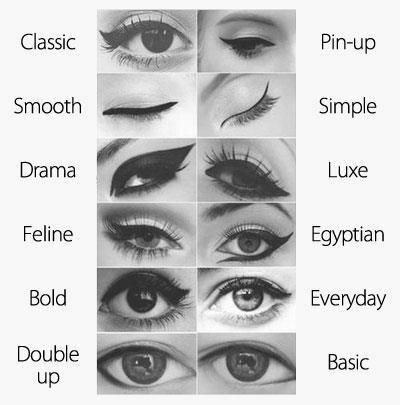 But one thing is certain, you need to have a steady hand and good practice to use a liquid eyeliner. It gives a smooth and glossy finish and has great staying capacity, especially the waterproof/smudge proof kind. 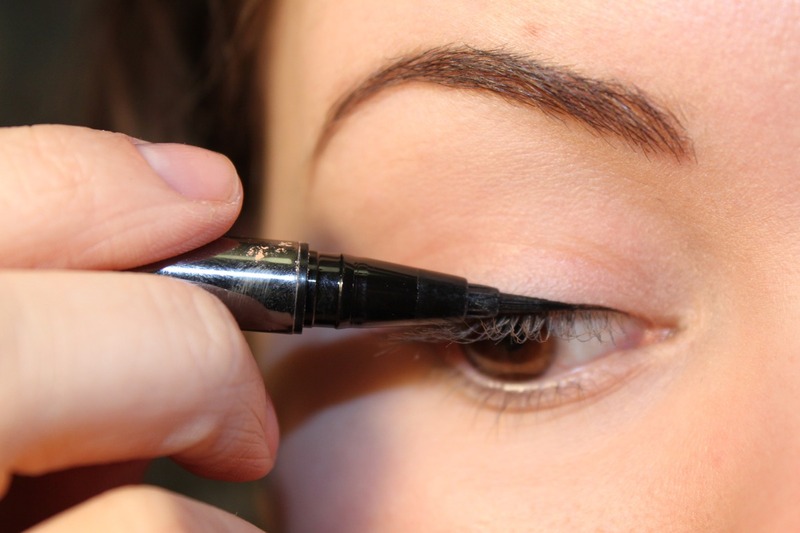 Liquid eyeliner creates a sharp outline and is a great choice for office wear. A delicate line close to the eyelashes will be enough to complete the subtle office makeup. 3. Gel eyeliner: For those who are looking for something in between a pencil and liquid one, a gel eyeliner is the ideal choice. The gel formula allows for easy application with an angled or flat brush. It stays on for many hours and can also be easily smudged to create the smokey effect. The applicator stick allows for defined lines which can be drawn more easily than with a liquid eyeliner and can also be easily corrected. Using an angled applicator brush makes drawing a winged line a breeze. It is the ideal choice when you are dressing up for a party or a celebration. It creates strong lines on the eyelids and the matte effect created by the gel works well to enhance the evening makeup. So it’s up to you, you can go for a dark and wide-winged look, or a simple and delicate tight lining effect comfortably with a gel eyeliner. One thing to remember – if you have oily eyelids, this should be your go-to choice. 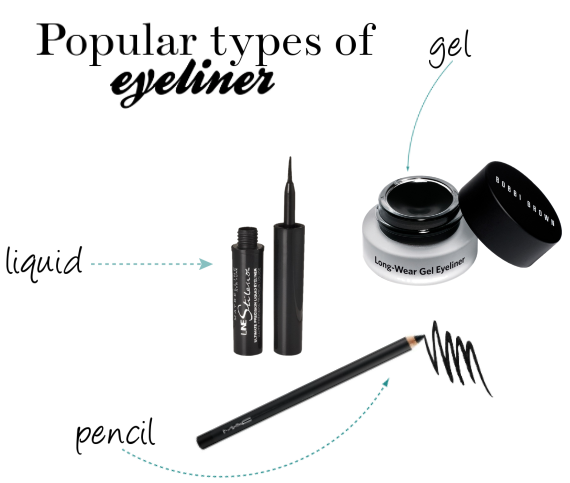 There are so many looks that you can try with all the different types of eyeliners. Choose the type you are most comfortable with, and you can even try combining one or two together to get the look right. All it takes is a little practice, and you’ll be flaunting your doe eyes in no time. When your eyes look this beautiful, people won’t be able to keep their eyes away.